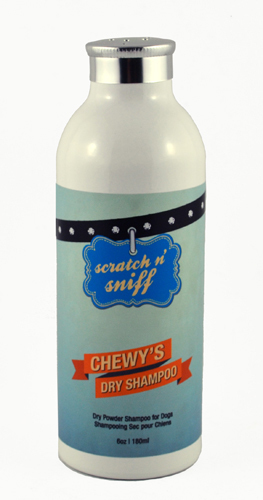 Chewy’s Dry Shampoo for dogs is a quick and easy way to remove dirt, excess oil and absorb odours. This dry shampoo is also handy during those cold winter months when exposing a wet dog to the elements is out of the question. Use between regularly scheduled “wet” baths to keep your pooch smelling furtastic! Our natural blend consists of cornstarch to absorb oily residue, china white clay gently exfoliates and cleanses the skin, baking soda neutralizes those nasty smelly dog odours and oatmeal soothes irritated, sensitive skin. Also enriched with tea tree oil to provide an all-natural antibacterial, anti-fungal and antiseptic benefit to this dry shampoo. First brush your dog to remove any excess fur and fur mats. Then, sprinkle Chewy’s Dry Shampoo into your dog's fur, massage gently making sure it reaches down to the skin. Keep powder away from eyes and nose. Leave on for up to 10 minutes, then brush the powder out. zea mays (corn) starch, sodium bicarbonate, avena sativa (oat) kernel meal and kaolin (white clay powder). essential oils: eucalyptus globulus (eucalyptus), lavandula angustifolia (lavender), cinnamomum zeylanicum (cinnamon leaf), citrus aurantifolia (lime) and melaleuca alternafolia (tea tree). For external use only. Do not apply shampoo to dog’s with open wounds. Avoid contact with eyes and nose. Keep out of reach of children. Discontinue use if irritation occurs.